I completely forgot to include the Micellar Cleansing Water from Sukin in my Current Beauty Favourites: a huge oversight, because I actually use this quite regularly. I use micellars in general quite regularly, thinking about it, whether it’s to remove a bit of my makeup pre-cleansing, as in with a balm or oil or cream, or to have a very speedy once-over in the morning when I’m running short of time. A micellar cleanser is a water with tiny droplets of oily cleanser suspended in it, just in case you were wondering; the oil attracts the dirt and then it’s all wiped away, which isn’t as ideal a situation – in my opinion – as breaking down the dirt with oils and then rinsing away, but it’s convenient if you’re not near running water. Or short of time. Anyway, the one from Australian natural beauty brand Sukin is lovely and soothing, but surprisingly deft at cutting through makeup. Even a mild bit of eye makeup, so long as it’s nothing too rubbery or claggy. It contains cucumber, aloe vera and chamomile and has a very refreshing feel, but doesn’t leave skin dry or tight. I’ve been really impressed and put it to the ultimate test the other day: I made it the “Duty Cleanser” during one of my crazy makeup-trying-on sessions. Four foundations and nine lipstick changes later… No soreness whatsoever and I didn’t have to rub at my face like a woman possessed. 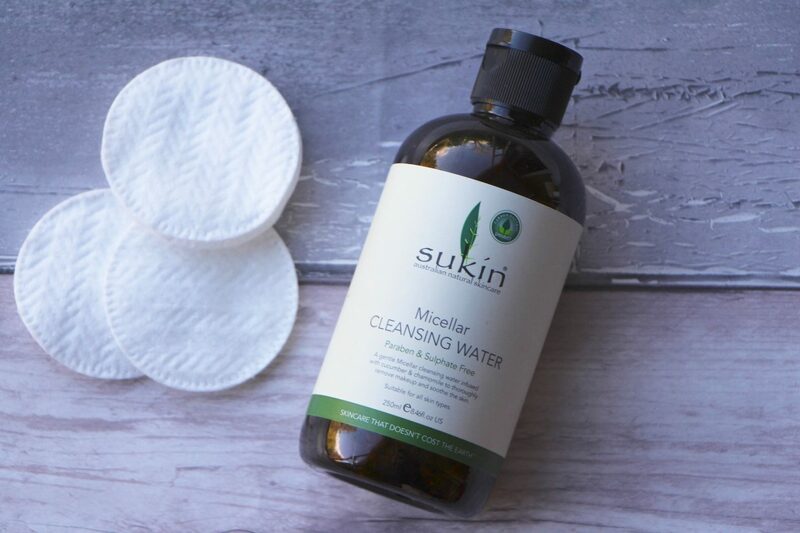 You can find the Sukin Micellar Cleansing Water at Boots here* – it’s £7.95. Sukin seems to be quite a lovely brand – their tagline is Beauty Shouldn’t Cost The Earth, and they are vegan and 100% carbon neutral. I have a few more bits to try, so I’ll keep you updated.